The Mirror Lake Hwy; Bald Mountain (11,943′) in the background. It’s only two weeks until the 60K race I am riding up in Island Park, ID. I needed to get out for a long ride in the snow today. The problem is that we have received so much snow in the past 10 days that the avalanche hazard is extreme just about everywhere. And you don’t have to actually be on a steep slope to trigger an avalanche. So the usual canyon rides were out. On Monday, things were so crazy in the mountains, and the lower stuff was a muddy mess, I decided to ride on the road, on my fatbike. I put in 28 miles on the Provo River Trail and the Murdock Canal Trail. I took two side trips up to Dry Canyon and Battle Creek Canyon to give me about a 1000 feet of climbing. Then on Wednesday I rode up Hobble Creek Right Fork to Wardworth Canyon and back (15.3 miles). It snowed wet and heavy all the way down. 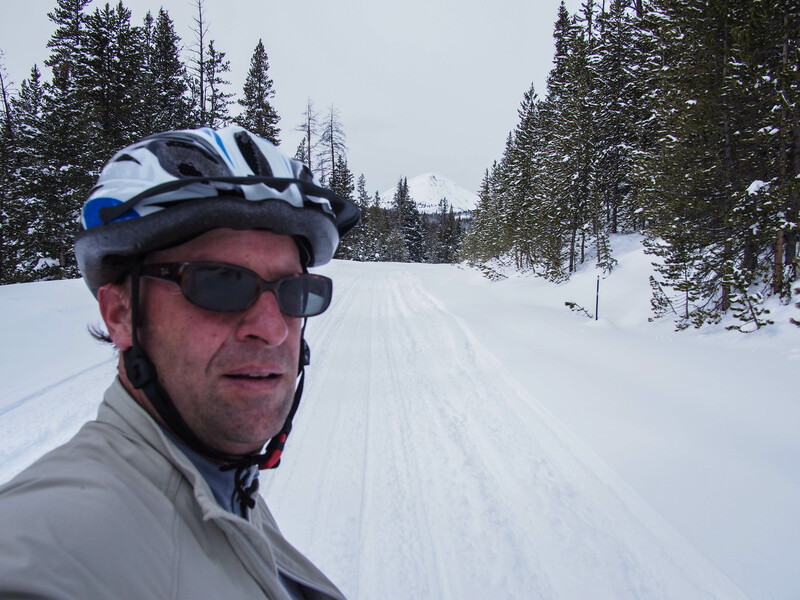 I decided to head up to the Mirror Lake Highway in the Uinta Mountain Range, about an hour drive from my house. I talked to someone at the Kamas Ranger District and she said the road was in pretty good shape, and that it was safe as long as you stayed on the road. I also checked out the online snowmobile report. The snowcat driver, in his report, said he has not seen that much snow up there in a long time. He got stuck once on the other side of Baldy and had to turn around. 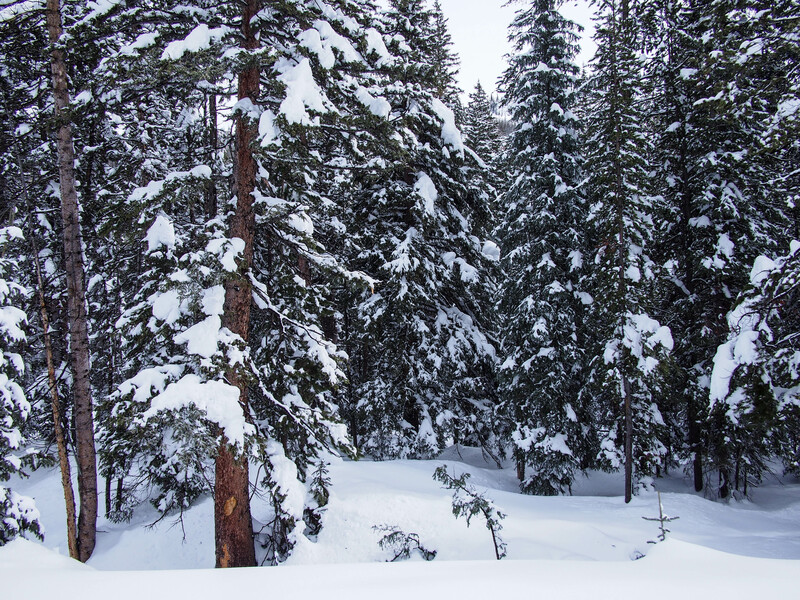 This last set of storms doubled our snowpack, at least in the Uintas. My two brothers, Bullet and Doc were down in St. George today riding parts of the True Grit course that they will be racing next month. 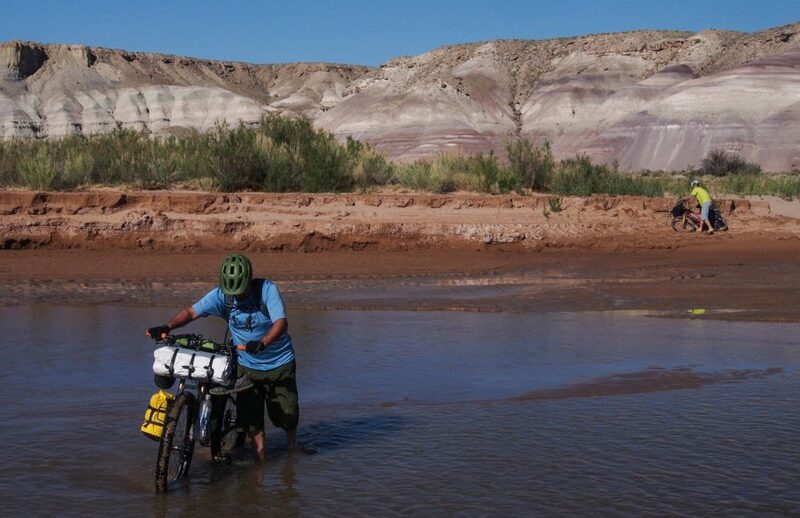 They rode 43 miles on technical desert terrain today, on fatbikes. Way to go. Of course, that also meant I was riding solo today. I’ve driven the Mirror Lake Highway many times to go backpacking in the Uintas. It is a beautiful area with forests, mountains, and lots of lakes. There are quite a few campgrounds and lakes right along the highway as well numerous trailheads that head off into the back country. 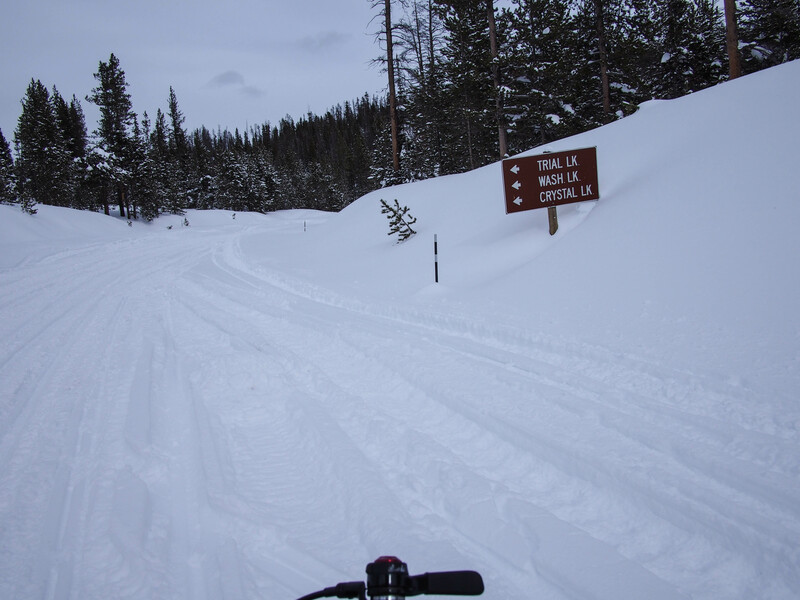 The road is plowed up to the Soapstone area, 15 miles from Kamas. Here the road is blocked, but groomed once a week on Thursday evenings. When I arrived at about 9:45 am, there were already numerous trucks with snowmobile trailers. 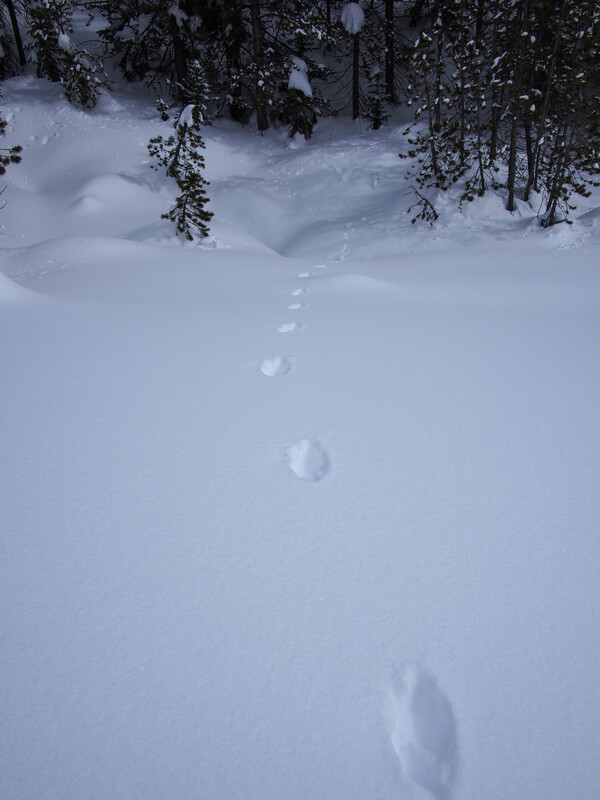 Many headed off into Soapstone Basin, but quite a few passed me heading up Mirror Lake. 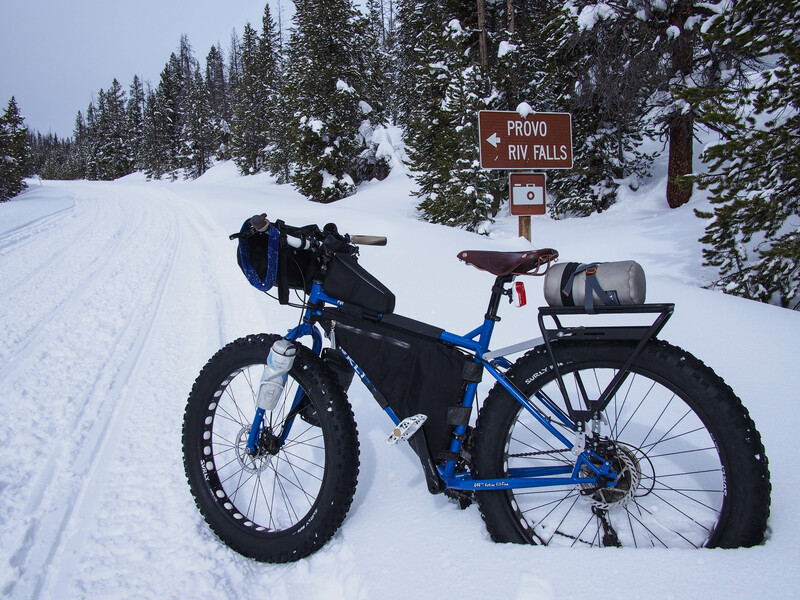 I thought that if the snow conditions were good, I would like to ride all the way up to Baldy Pass at 10,687′ and 15 miles one way, but that would probably be pushing it a bit. But I did want to ride at least up to Trial Lake. It was in the low 30’s when I started and the road was surprisingly in pretty good shape. Because these last few storms have been quite warm, the snow has been heavy and dense. This makes for good packing. I enjoyed the first few miles and had no problems with traction or anything. Just good grippy snow. I passed three dog sled teams on my way up. Because it was so warm, the dogs couldn’t go too far. One of the three dog sled teams. As the day progressed it continued to get warmer. By early afternoon it was in the high 40’s and I had shed my softshell, earband, and gloves. The snow conditions likewise deteriorated. 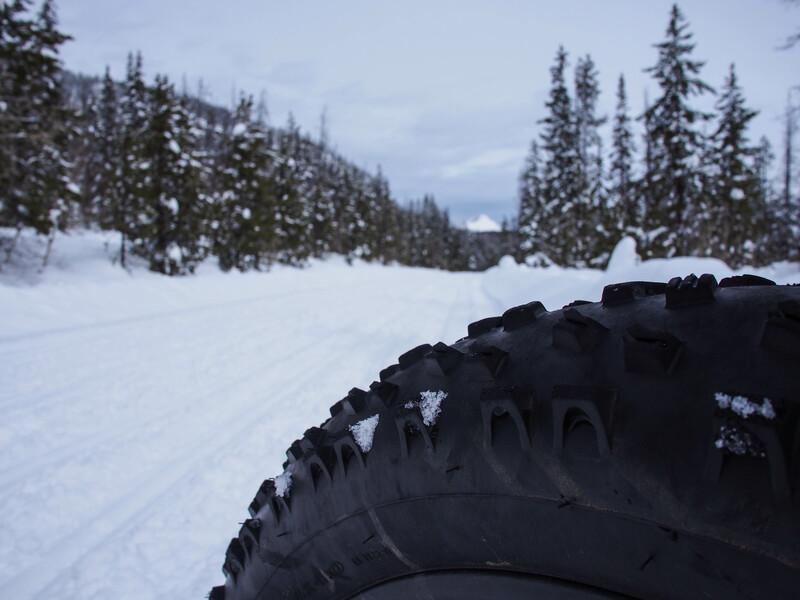 The combination of snowmobile traffic and the heat was really softening up the snow and making it more difficult to ride. I pushed on. A few snowmobiles stopped to check out my bike. One lady asked how long it had taken me to get that far. I told her two hours and twenty minutes. She said, “And that’s fun?” I guess its all relative. 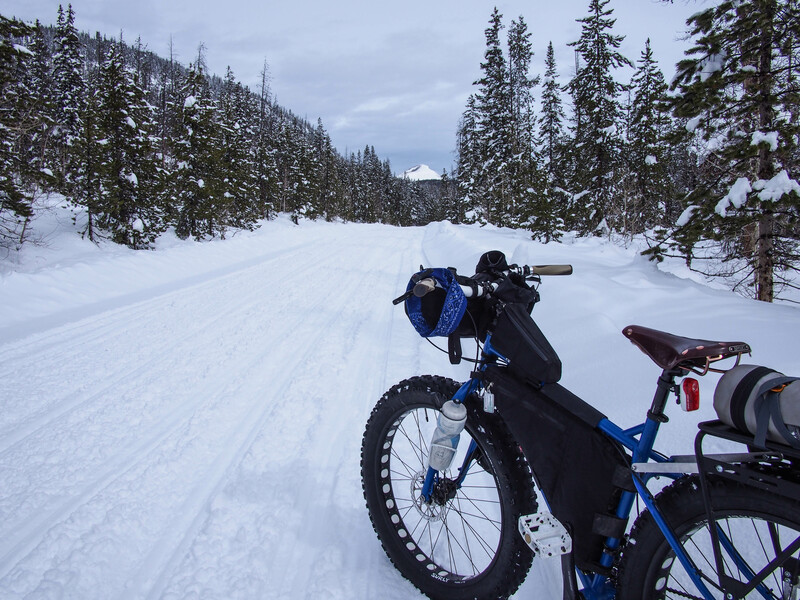 I love to be out in the mountains, no matter if I am on a bike, on foot, or on skis. Baldy finally came into view; it looked a long way off still. Baldy, still about 7 miles off, and Nate. I was getting pretty tired. Because it was so warm I was drinking a lot. I’m glad I brought an extra 1 liter Nalgene bottle. I just strapped it to the back rack. When I got to the turn off for Provo River Falls, I was pretty tired and contemplated turning around. But thinking about riding 35+ miles on snow in two weeks, motivated me to keep going. This would be good training. Provo River Falls turn off. I would have liked to gone over to check out the falls in winter conditions, but there were no snowmobile tracks heading over there and the snow was very deep, probably at least three feet. When I stepped just on the edge of the road, I immediately sunk up to mid thigh. Heading up past Provo River Falls. 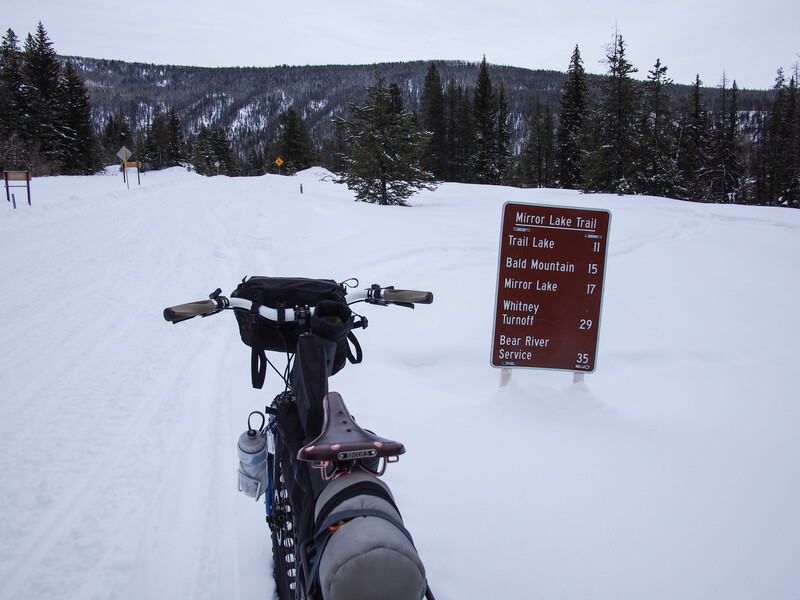 After a bit of hike a bike on soft, mushy snow, I finally arrived at the Trial Lake turn off, and I was glad. I was quite tired and I was looking forward to the ride down. I had climbed 2000 feet in 11.8 miles to get to this point. Trial Lake turn off. The Lake is actually very close to the road. The downhill started out very nice and fast-ish (my top speed was 20.8 mph). It was soft in places and I slid around a bit at times, or I would hit some soft sections and sink, but it was nice to have gravity on my side. The upper part of the road is also quite a bit steeper than the lower sections. The first three or four miles went by quite fast and I was enjoying coasting on the steeper sections. I think I only braked slightly on one steeper section. 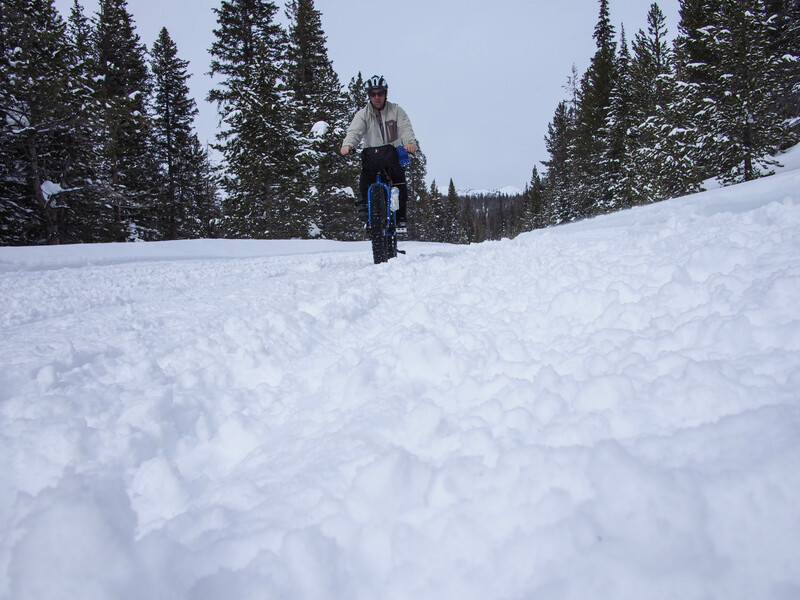 When the road would flatten out a bit, the riding was more difficult as the snow was getting softer and softer as the day progressed. I finally got to the last two miles, and unfortunately those last two miles are relatively flat. The snow was a mess. 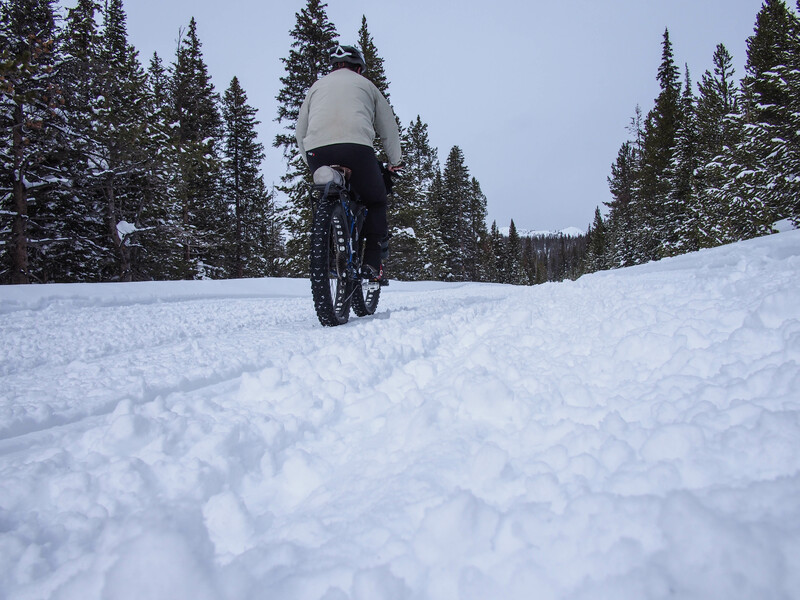 Think soft, wet, sloppy snow, like riding through mashed potatoes. My front tire was washing out every 20 or 30 feet. I lost count of how many times my bike totally washed out and I had to bail off. It was really frustrating. It didn’t help that I was really tired and ready for this ride to be over. It was like a cruel joke. I’m really tired, and the snow is really sloppy and I’m slipping and sliding all over the place. I finally rounded the last corner and could see the parking lot; then I washed out a few more times in the last 400 yards. In the end it was a good ride. The scenery was beautiful. It was my first time up there in the winter. In total I rode 23 miles and gained 2000 feet. It took about 4:15 to get up and 1:45 to descend. I know, pretty slow. That will probably be my last long ride before the race. 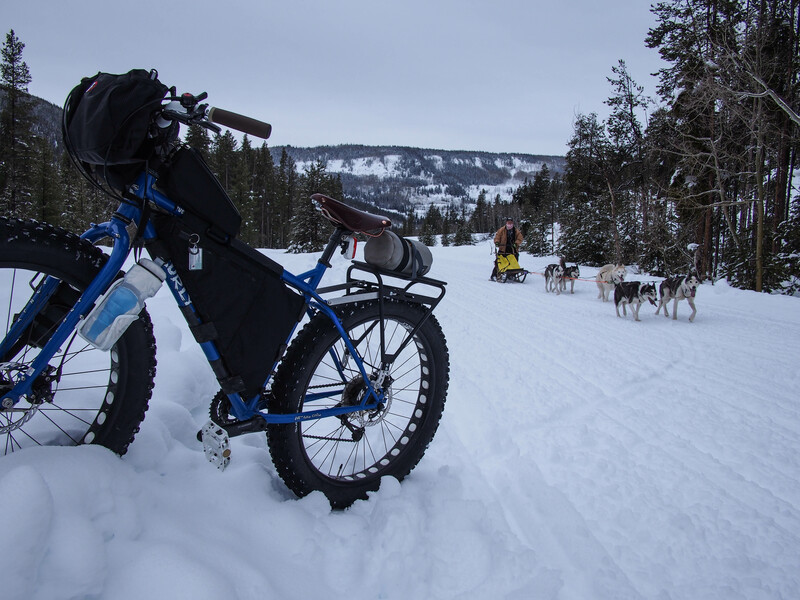 I sure have a great deal of respect for those guys that do those long snow races like Arrowhead and the Iditarod Ultra. Riding in less than ideal snow conditions is really tiring.